"This program far exceeded what I expected," said Supply Management Officer Paul Venturella. He was speaking of the pilot program to have college students earn class credit while applying their specialized knowledge and skills to advance the work of the Architect of the Capitol (AOC). The first student in the program, Mary Delaney also said the internship exceeded expectations, "In my first project alone, it truly felt like I had done meaningful work." Internships, by definition, are professional apprenticeship experiences that give students the opportunity to gain practical experience in a professional environment. It is the opportunity to expand horizons and apply classroom knowledge in the real world. Yet we know that not all internships are created equal. The AOC strives to make the intern experience substantive, challenging and rewarding. And that same philosophy was evident during the piloting of the AOC's new work-for-credit intern program in the House Office Buildings. 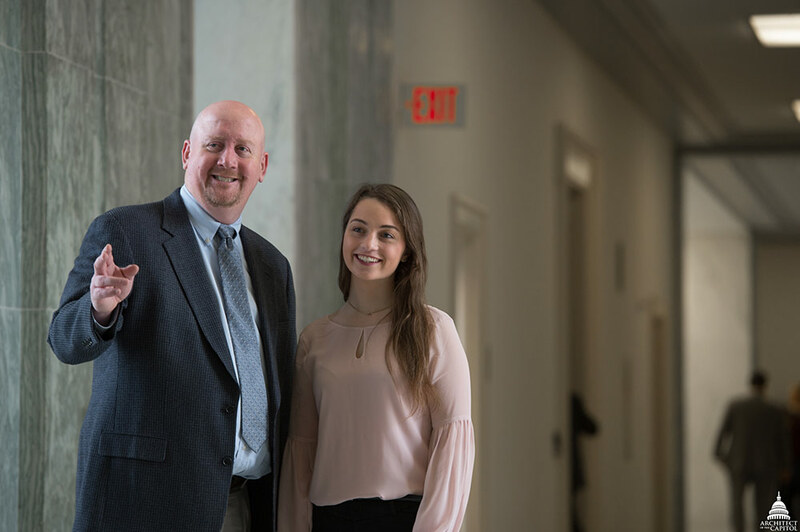 Delaney, a finance major, was selected to work in the Inventory Management Branch in the House Office Buildings, where Venturella is the supervisor. Along with his employees, Venturella manages the supply chain for the jurisdiction to ensure it has the parts and supplies necessary to do its work. They operate behind the scenes, but Venturella knows their work is essential to the success of frontline employees, "If it takes a shop less time to get the supplies they need, they have more time to serve our customers and can serve them better." AOC Supply Management Officer Paul Venturella reviews records with intern Mary Delaney. "We are always working to make our shop more proactive," he said. But, just one unforeseen event can delay those efforts. "If there's flooding, we can't wait to order the supplies needed to clean that up and make the repair." Venturella needed someone who wouldn't be taken off task by emergencies, could work independently and was driven to deliver. "We have a lot of hard-to-fill positions," said Talent Acquisition Program Manager Lisa Maltbie. "Talent acquisition is a way of both expediting the hiring process for them and being more strategic. We look ahead at the long-term needs of the agency and we identify likely sources of employees to meet those needs." This led her to a job fair at Catholic University, where she represented the AOC with House Office Buildings Assistant Superintendent Dan Murphy. They learned that practical experience is a graduation requirement, for which the university gives students course credit. Interested in opportunities to grow her knowledge of business and help her narrow — or expand — her educational pursuits, Delaney's academic advisor suggested she explore and apply for an internship with the AOC, which she did. After she was selected, and reported to her first day of work, Delaney admitted that, "It was a little intimidating walking past the big Dome in the morning." However, when she got to her desk, her colleagues put her at ease. "Everybody was so nice, and they all know and support each other. It was a good, positive culture." She also credits her supervisors and colleagues for helping her make the internship at the AOC her own. The feeling she had, standing in the shadow of the U.S. Capitol, didn't leave Delaney, though. "It was constantly on my mind: do the best that I can." Venturella still wasn't sure what to expect. "I thought that she might complete one project," he said. He tasked Delaney with creating a more efficient process for procuring replacement parts and services for the House heating and cooling systems. Perhaps Venturella would have had higher expectations if he had known that in addition to doing the work required for her finance major and two minors, Delaney also enjoys hurling. "It's an ancient Irish game, called the fastest sport in the world, because you're constantly running full speed," she explained. AOC Assistant Superintendent Dan Murphy shows Mary Delaney around the Rayburn House Office Building. When she got her first assignment, as she does in a hurling match, Delaney hit the ground running. On her second day, Murphy stopped by her desk. "She already had a spreadsheet that analyzed the cost of each purchasing action for one service," he said. "We could immediately see if each one was worth it." In that first project, Delaney was able to bundle separate purchases of the same service into one contract, eliminating processing time for each transaction and saving Venturella's shop 100 labor hours every year. Despite never being exposed to federal contracting, Delaney was able to successfully draft a statement of work for a contract. "She needed direction, but no handholding. When she didn't know about something, she researched it and found the answer," Venturella said. The work was also rewarding for Delaney. "When I saw the replies to the contract from suppliers in my inbox, it was fulfilling. I did my best work on this. I had started from scratch. It tied together everything I had been working on." But she had only just begun. By the end of her term, Delaney had completed a half-dozen or more projects. "They were all from my wish list to make supply management more proactive," Venturella said. Murphy considers the program a success and has worked with Maltbie to select the next intern. "We achieved our goal to improve efficiency. Now, our only question is, 'What is the next win?'" Written by Franklin Bradley and Erin Courtney, AOC Communications and Congressional Relations team members. This internship is a pilot project, but the AOC has two active intern programs, including the Summer Intern Employment Program and the Co-op Program. The summer program is a 12-week, paid opportunity that introduces students to a professional work experience, enhancing their academic or trade school development in preparation for their chosen vocation. The Co-op Program offers students the opportunity to work while completing their studies with the guarantee of a permanent job upon graduation. Be sure to follow our accounts on Twitter and LinkedIn for announcements about opportunities to join the team.